Glaucoma is a condition which affects the eyes and eyesight of the sufferer; it is the leading cause of blindness across America. In fact, according to the Glaucoma Research Foundation, over 120,000 Americans are blind due to Glaucoma, accounting for 9-12% of all cases of blindness. With over 3 million Americans suffering from the condition – and only half of this amount being aware they have glaucoma – scientists are now trying to find more effective ways to combat the symptoms and provide more natural treatments for sufferers. With such severe side effects at stake, more and more patients are looking to CBD for potential medicinal relief, and while there is no official cure, the studies and anecdotal reports by sufferers are pretty encouraging! But can CBD help those who suffer from glaucoma? We have put together all you need to know about the condition and how CBD could help. Glaucoma occurs when the optic nerve is damaged. The condition is degenerative, meaning it does get worse over time, and in many cases can lead to partial or full blindness if not treated or caught in the early stages. Although glaucoma affects around 3 million Americans, a shocking amount of people claim never to have even heard of the condition, which is why so many sufferers go about life not knowing they have it at all. While it may seem unusual to suffer from a condition that can lead to blindness without even knowing about it, glaucoma usually acts slowly over some years, with symptoms occurring over a length of time and making it less easy to pinpoint. More often than not, a diagnosis is only ever made at routine optometry appointments. Glaucoma is typically a result of too much fluid build-up in the eye, causing an increase in intraocular pressure that can lead to nerve damage. The optic nerve serves as the link between the eyes and the brain, so when this is damaged our ability to see is compromised. Obviously, the worse the damage, the more impaired our sight becomes, with many cases leading to complete blindness. Age: Typically, glaucoma affects those in the latter part of their life. The older you are, the more likely you are to develop it. Ethnicity: Those most likely to develop glaucoma are amongst the African and Asian ethnic backgrounds. Family history: Genetics do play a part in whether you will develop glaucoma. Other health conditions: Glaucoma can come as a result of other underlying health issues such as diabetes and poor eyesight. Primary Open Glaucoma: This is the most common type of glaucoma and often develops slowly over a long period, making it harder to detect. Acute Angle Closure Glaucoma: This type of glaucoma is less common and is considered more severe and a lot more sudden. With acute angle closure glaucoma, symptoms can come on immediately and out of nowhere as a result of eye pressure rising very quickly. Secondary Glaucoma: This type of glaucoma occurs as a result of other health conditions. Conditions such as diabetes, eye surgery, or cataracts can lead to secondary glaucoma. Congenital Glaucoma: This type of glaucoma affects children and is much less common than the other types. Of course, it is important to note that the symptoms can vary massively depending on what type of glaucoma you have, and most sufferers don’t suffer from any symptom until the glaucoma is well-developed. It is for this reason that regular optician appointments are vital to ensure you can catch the condition in its early stages. What Treatments are on Offer for Glaucoma? Prostaglandins: Potential to cause stinging, burning, or a change in eye color. Beta-blockers: Potential to reduce heart rate; can cause adverse effects to those suffering from depression, diabetes, lung problems, and heart problems. Alpha-adrenergic agonists: Potential to cause red or bloodshot eyes, itching, and dilated pupils. Carbonic anhydrase inhibitors: Potential to cause pupil constriction, burning, and poor sight in the night. Just from looking at a small selection of the most typical treatments for glaucoma, it is no surprise really that many patients are disenchanted with the current state of affairs. Other reasonably common therapies also include surgery to help the draining of fluid, or laser eye surgery to open blocked tubes. Cannabis has been used to help treat glaucoma for many years: As a plant that has been researched and thought to possess potent anti-inflammatory and neuroprotectant properties it has been a much-needed relief for many suffering from glaucoma. However, while it may work fast to reduce many of the symptoms of the condition, it is also reasonably short-lived, meaning that patients are required to regularly ‘top up,’ which can be quite expensive. While research has shown that THC can be effective in treating glaucoma, CBD has been the most recently researched alternative as it offers many of the same benefits, without the mind-altering high! Don’t just take our word for it – researchers have been looking into this subject for years! In fact, the first study* of this kind was done on a small group of people way back in 1971! Scientists Hepler and Frank found that smoking marijuana reduced intraocular eye pressure (IOP) by up to 30% and lasted around 3-4 hours before a further dose was required. Since this finding, there have been many studies done both into cannabis and CBD as a potential treatment for the debilitating condition. Research* has also shown that CBD can relieve stress, inflammation, insomnia, pain, and anxiety as well as reduce blood pressure, all of which are widely believed to impact the amount of intraocular pressure present. So if this is the case, then CBD should, in theory, be able to target IOP in patients in a natural and relatively non-invasive way. But how does CBD work so effectively? Like with most conditions that CBD can assist with, it largely comes down to our endocannabinoid system (ECS). The ECS is the human body’s very own cannabinoid maker! It plays a crucial role in our health and wellbeing, regulating a host of things from mood and appetite; to our core temperature and even the way we feel pain! By releasing natural cannabinoids, the ECS helps to keep on top of things going on in our body. However, our ECS can be compromised, and this is where CBD steps in. Cannabidiol (CBD) works alongside our ECS to encourage a more extensive production of endocannabinoids, making our body more capable of regulating itself and combating unpleasant symptoms. This means that the cannabinoid receptors that are situated throughout our body can benefit more quickly and efficiently, and heal faster. There are plenty of cannabinoid receptors situated in the ocular tissues, and these are responsible for regulating the intraocular pressure. So by all measures, CBD sounds like a good candidate to take on the role! But why CBD oil over cannabis as a whole? As discussed, there is the massive downside of the never-ending high associated with medicating with cannabis for this condition. However, on top of this is the risk associated with smoking, as this can raise intraocular pressure! Luckily, you can bypass those risks by administering CBD oil, or vaping it, which will ensure a higher level of bioavailability when compared to eye drops – which you can get with CBD, but it only reaches a small area of the target (around 5% of drops administered reach the area). It goes without saying that, whether you are a lover of weed or you prefer to reap the medicinal benefits alone, the cannabis plant has a lot of potential for those suffering from glaucoma. 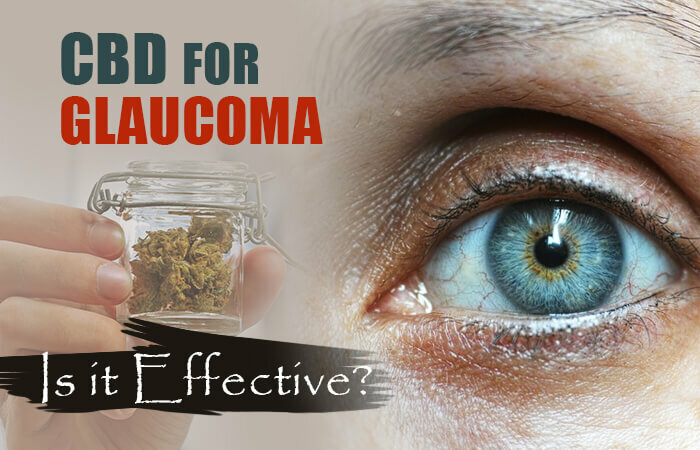 While research suggests that CBD oil can, in fact, be a great alternative to the riskier traditional treatments, it is important to remember that too much CBD can in fact cause glaucoma symptoms to be worse. Furthermore, it’s important to understand that CBD has not been approved by the FDA, and therefore it is extremely important to consult with your primary physician before consuming any CBD oil. A study published in 2006 revealed that, while THC temporarily reduces IOP in Glaucoma patients, 20mg of CBD did not reduce the IOP, and 40mg of CBD caused the IOP to rise. These findings are pretty interesting and show that, while the studies revealing the benefits of CBD are important, it is also vital to to always consult with a professional.